On June 26, 2004, in newspapers across the country, a box score revealed that Carlos Beltran had gone 2-for-4 in Houston’s 3-1 loss to Texas the night before. The box score also revealed, with the usual statistical economy, that Beltran had hit a double and scored Houston’s only run and was now batting a robust .500. And so, a question: How could any player, in any league other than Little League, carry a .500 average into late June? The answer, in short, is that Beltran wasn’t batting .500. He was batting .281. What the box score actually revealed — what it said in so many numbers —is that Beltran had posted only four National League at-bats that season and, in them, those two base hits. Indeed, the game against Texas had been his first in the Senior Circuit, or at least as a member of a Senior Circuit team, and the box score simply registered his freshly constructed NL average while leaving unpublished his composite mark. I’m no quirky archivist, preserving arcana from Mid-South periodicals as an unusual pastime. Nor am I a hoarder, inviting intervention while clearing passageways through mounds of moldering newsprint. To the contrary, I became privy to these published obscurities while opening a box during a recent move, a box long in storage and with scattered pages of the Commercial Appeal as packing material. Torn, crumpled, and brown with age, the pages are partial records of a long-gone time, hardly antiquarian but still descriptive of a day in the lives of (mostly) former players. Uncrumpled and spread flat, the pages attest to the connectedness of published reports — see page D2, continued from page D1 — and of the players who populate the 12-point print, their biographies so sensitive to the contingencies of the ball field. They attest, too, to the separateness occasioned by those contingencies, the dramatically disparate trajectories taken on by players whose bios only briefly — but therefore permanently — intersected, there to make history of a single pitch, a solitary pop-up, a GM’s backroom decision now borne out in 15-year-old font. Today, equipped with that notorious newspaper killer called the Internet, I swiftly discern the stories, among so many others, of two men whose marginal talents consigned them to footnote status, filler for the Briefly section, fodder for its agate type, the small print incompatible with what was, and remains, life-changing news for Chris George and Mike Tonis. Two days prior to the Beltran box score, and thus one day prior to Beltran’s Houston debut, lefty Chris George took the mound for the 28-40 Royals in their June 24 home game against the 31-39 Tigers. It marked his fifth start of the season and the 42nd of his four-year major league career. Serving as George’s battery mate was 25-year-old Mike Tonis, called up from Double-A Wichita after Royals starting catcher Benito Santiago suffered a broken left hand. 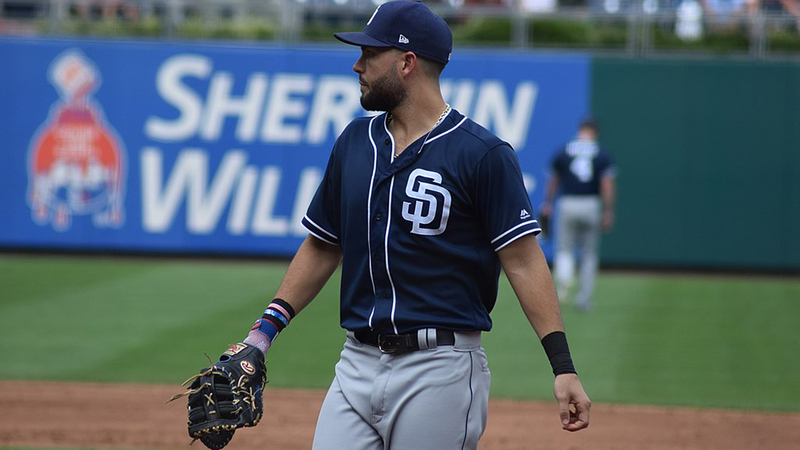 The afternoon contest marked Tonis’ second start of the season and, in fact, the second of his three-day big league career. Manning center field, meanwhile, was the 27-year-old Beltran, a successful product of the Royals draft and an ongoing target of trade rumors. In the bottom of the first inning of this clash of bottom-dwellers, Beltran bolstered his trade-worthy bona fides by homering to give KC a 1-0 lead. It was a lead, alas, the Royals would not maintain. In the second inning, George yielded three doubles, two singles and a walk while surrendering six runs. After a scoreless third, he gave up three runs in the fourth without recording an out and was promptly lifted. Tonis, meanwhile, had done George no favors, committing a fourth-inning passed ball that put two runners in scoring position. A Pudge Rodriguez single would plate both and put an end to George’s day. Nor had Tonis done his team, or himself, any favors, grounding out to open the bottom halves of the third and fifth innings. Then in the ninth, with two outs and Detroit up by nine, Tonis popped up into foul territory along the third-base line. Tigers third baseman Brandon Inge had already made two errors that day. Would he now make a third, misplaying a routine pop-up to give a 25-year-old rookie another chance for his first big league hit? Nope. Inge settled under the pop-up and clenched it for the final out. Tonis couldn’t have known it at the time, and wouldn’t know it for several more seasons, but a three-team trade that same day would help ensure that his seventh-inning walk had been significant. It had been the one time, and would be the only time, he reached base in seven career plate appearances. Beltran, for his part, would go on to hit eight home runs in the 2004 NLDS and NLCS. 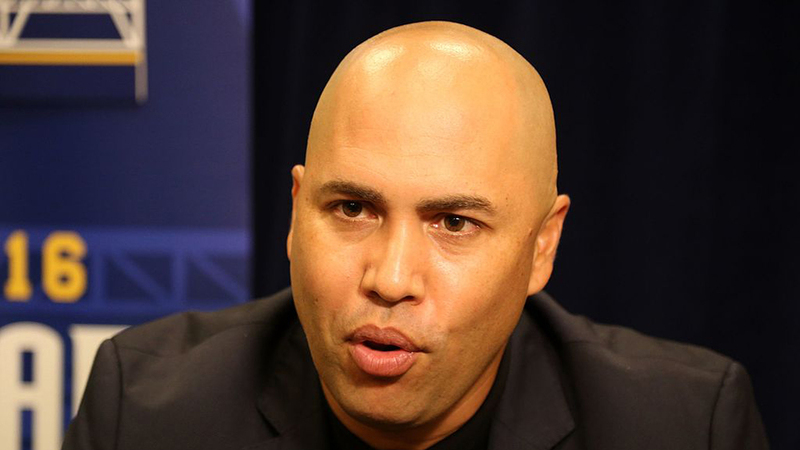 In the span of one fortnight, Beltran became a star — a TV star, really — and a bellwether for the persuasions of free agency. He had cha-ching written all over him and cashed in with the Mets. Chris George? His trajectory differed. Following his demotion, the onetime first-round draft pick returned to make one start. In it, he lasted just three innings, yielding 11 hits, two walks and 10 earned runs in a loss to Cleveland. Optioned back to Omaha, he returned to the parent club as a September call-up. In his first game back, he relieved a promising rookie starter named Zack Greinke in the sixth inning of the Royals’ eventual 26-5 drubbing of the Tigers. Clearly, the Royals couldn’t sustain that sort of offense, not quite, and scored “only” 17 runs in his next outing, beating the Yankees by nine runs as George pitched the final two frames. George got the start in his final appearance of 2004, facing Mark Buehrle and the White Sox and lowering his season ERA to 7.23 by yielding one earned run in 4.2 innings. His final pitch of the contest went for a run-scoring single by Juan Uribe. It was also the final pitch of his major league career. George would pitch eight more seasons of minor league ball — all in Triple-A — without receiving another call-up. According to his LinkedIn page, he is now a salesman for a Houston-area lighting company. As for Mike Tonis, he is now a player agent with the Boras Corporation. In all likelihood, his short history in major league baseball — and longer history in minor league ball — allow him singular insight. Following his demotion, the Royals asked him in 2005 to make the switch to the mound. He did. It didn’t last. Tonis, who had already endured back and shoulder injuries and a hit-by-pitch broken jaw, promptly suffered an elbow injury and underwent Tommy John surgery. He slipped off the radar and into the archives, browned by the years and found in a box. A lot can happen, and will, in the wake of a three-team deal. On the very day Chris George and Mike Tonis were sent down to the sticks, Felix Diaz was called up to The Show. So reported, and still reports, the Briefly section on page D4 of the June 26, 2004, edition of the Commercial Appeal. Diaz, a Dominican right-hander, had made a name for himself two years earlier when he, along with minor league reliever Ryan Meaux, moved from the Giants system to the White Sox system in San Francisco’s midseason trade for center fielder Kenny Lofton. The speedy Lofton went on to score 16 runs in 17 games for the Giants in their 2002 postseason run while Diaz and Meaux went on to pitch for the 2002 Birmingham Barons and Kannapolis Intimidators, respectively. With the benefit of both hindsight and an Internet connection, I can report that Meaux would later top out at Triple-A. No agate type, no Briefly section, would ever report his call-up. As for Diaz, I can tell you that on the day the Commercial Appeal reported his call-up, he posted his first major league victory. On that afternoon at U.S. Cellular Field, in front of 39,553 fans, Diaz bested the crosstown-rival Cubs and starter Carlos Zambrano by yielding three runs on six hits en route to the 6-3 win. In his next start, Diaz again faced the Cubs and again a stellar starter — namely, Greg Maddux, four-time Cy Young Award winner and future Hall of Famer. Again he yielded three runs but this time in four innings en route to a loss. On Sept. 5, after a pair of disastrous starts in which he yielded a combined 12 earned runs in eight innings, Diaz got the nod against Seattle. The next day, in newspapers across the country, the Associated Press reported on his outing. Felix Diaz did something that few pitchers have been able to do lately. He found a way to shut down Ichiro Suzuki. Indeed, Ichiro had posted an astounding 223 hits in 134 games on the season and had set his sights on George Sisler’s all-time mark of 257 hits. A day earlier, in game two of the three-game series, he had gone 5-for-5. Diaz gave up one run and five hits — none to Suzuki — in six innings to lead the White Sox to a 6-2 victory over Seattle yesterday. Every ballgame, as affirmed in print, sits on the pivot of history. Its players lean on the past —their routines, their superstitions — to commit to permanence the fluid, the indefinite, the mercurial candidacies of on-field performance. Anything can happen, or almost anything, and it waits on the hinges of what becomes a box score. Maybe, for sure — there is always the maybe because there is always the contingent, the conditional, the action that is not a fact until it passes through every possibility to become one. It might have seemed to Diaz, and to observers, that great things lay ahead for the 23-year-old hurler. He had found his pitches, maybe, and his confidence, maybe, and now he would find his groove. Hindsight tells us differently. The outing against Seattle would be his last major league start and last major league win. He would pitch in nine more games that season, all in relief, and they would be his coda. The final pitch of his major league career: a ball four, on a 3-0 count, to .228-hitting Desi Relaford. It is printed. It is done. Newspapers are, and will remain, history writ small, the equivalent of agate type when contrasted to the larger font of the annals. Newspapers are box scores, you might say, while history is the back of the baseball card. The back of Scott Seabol’s baseball card reveals that the 6-foot-4, 200-pound Pennsylvania native debuted with the Yankees in 2001. It’s done, printed. Also printed, just half an inch from the Beltran box score, is the box score for the June 25 game between the Cardinals — for whose Triple-A team, the Memphis Redbirds, Seabol was posting big numbers — and Beltran’s recent team, the Royals, so recent that Beltran had homered in their June 24 game against Detroit. The game story tells us more — more of what the moment meant. Facing Scott Rolen with the bases loaded in the third inning, Zack Greinke was determined not to let a grand slam go sailing over the wall. And he didn’t. Instead, the rookie right-hander gave up a three-run double that sent the St. Louis Cardinals to a 5-2 victory Friday night over the Kansas City Royals. This time, Chris George wasn’t around to relieve the rookie. George, like Seabol, was down in the sticks. There he was, fresh out of spring training, standing in Yankee Stadium wearing the New York Yankees pinstripes. Scott Seabol was in baseball heaven. . . . In the midst of the Yankees’ 16-5 win, Seabol got word from manager Joe Torre to pinch-hit. He stepped into the batter’s box to face lefty Dan Plesac and proceeded to pop out to second base. What may seem like a forgettable moment to most is one that Seabol cherishes. That single out more than three years ago remains the only major league experience for the 28-year-old Redbirds infielder. The story continues with a quote from Seabol. There, in parenthesis, the print abruptly stops. And page D9, where the story continues, is torn diagonally from the top, so that the rest of his quote is absent. No continuation is necessary, though, to know where Seabol was going: nowhere. He was in Triple-A Memphis, 1,101 miles from baseball heaven. He was in a minor league ballpark, 284 miles from Busch Stadium, where Rolen was en route to a 9-WAR campaign. As for Seabol, he was in the midst of a Triple-A season in which he’d slash .304/.356/.539 in 138 games. He would homer 31 times. Still, he couldn’t get up and out, and no 15-year-old quote is needed to convey his frustration that, at the time, he had sipped the smallest cup of coffee: one major league at-bat. Confined to torn paper, I examine what remains. … like many others, has spent … three seasons on a quest for … more chance, one more opport … to show he has something to … bute in the major leagues. Every story is fragmentary, incapable of assimilating all elements of its making. And each, like Seabol’s, is somewhere continued, in the balance of whatever comes next. Lower on page D9, the story ends with a quote —this one complete. Seabol did move on. His story didn’t end with that punctuation. In the bottom of the fifth inning of the Dodgers-Cardinals game on May 10, 2005, Scott Rolen slapped a comebacker to L.A. starter Scott Erickson. The right-hander fielded the ball and tossed it to 240-pound. first baseman Hee-Seop Choi. The throw pulled Choi into Rolen’s path. The two men collided. From there they went their different directions. In the top of the sixth, Rolen left the game, injured. In the bottom of the sixth, Choi hit a three-run homer to give the Dodgers a lead they wouldn’t surrender. Two days later, amid an 18-game hitting streak, Seabol got the call for which he’d worn the uniform. He’d now make the 284-mile trip, up and out. All of page D4, from top to bottom and side to side, is about baseball. And all of it, notwithstanding a small and perhaps symbolic tear in the team standings, is intact, each word and every digit readable and thus descriptive of a day in the life of major league baseball in the year of our Pastime 2004. I say “symbolic” because the standings, like other numbers across the page, were subject to disruption, in need of season’s end to become final. And indeed, they did change. Half of the division leaders on June 26 — Florida, San Francisco and Texas — would lose their grip. Conversely, the Yankees would maintain their lead over Boston, but Boston, as we’re aware, would get revenge come playoff time, riding Dave Roberts’ headfirst slide to a title. Fortunes change, often quickly, en route to archives that become immutable. Cases in point: Along the right margin of the page, opposite the standings, are the league leaders in batting average, home runs, win-loss record and strikeouts. Only one —- Randy Johnson, in strikeouts — would maintain his lead through the season finale. More notable — and, in their own way, more enduring — are the fates of many also-rans, men who, unlike Johnson, weren’t booked for Cooperstown. Take Paul Wilson. Through Thursday’s games, as page D4 puts it, the Cincinnati starter was leading the circuit in win-loss record with a 7-1 mark. Through the remainder of the games, however, Wilson went 4-5 to finish at 11-6. It had been a bad end. He would have a worse start. On May 6 of the following season, with his record at 1-2 and ERA at 5.25, Wilson took the mound at Great American Ball Park for a game against the Dodgers. With the second pitch he hit L.A. leadoff man Cesar Izturis. Three pitches later, Hee-Seop Choi — who, in four days’ time, would collide with Scott Rolen — took him deep. The next six batters went single-homer-walk-hit batsman-double-double to put the score at 8-0 and drive Wilson from the contest. Today, Wilson is one of two pitchers to have failed to retire any of the first eight batters of a major league game. For me, that June 26 newspaper is an accidental artifact. For Wilson, it should be a keeper, a necessary relic of his time in the majors. It observed, and continues to observe, the summit of his career. Likewise Ken Harvey, the Kansas City DH, whose batting average would plummet from that season-high .346 —good for fourth in the AL through Thursday’s games — to .287 at season’s end. He would play just one more season — in fact, just 12 games — before vanishing from the majors at age 27, a man who’d seen the summit but was now bound for Omaha, Oaxaca and again KC, where, five years after his only All-Star berth, he played for the independent T-Bones. Likewise, too, Esteban Loaiza, whose 7-3 record placed his win percentage at ninth in the AL, tied with that of Pedro Martinez. From there the men would go their separate ways — Martinez to Cooperstown, Loaiza to prison. In the bottom left corner of D4, just above the Briefly section that outlines the Diaz promotion and the George and Tonis demotions, is the Notes/Moves section. One item describes how Braves pitcher Paul Byrd got a grounder stuck in his glove and subsequently tossed the glove — with the ball inside it — to first base for the out. Boone, whose 11th-inning homer in Game 7 of the ALCS last season put the New York Yankees in the World Series, hasn’t played since injuring his knee during a basketball game in January. Given the future of history, we know how that turned out. In the lesser consequence, Boone went on to play for Cleveland. In the greater, Alex Rodriguez went on to play for New York, taking the vacancy created by Boone’s injury to earn two MVP awards and a World Series ring in pinstripes: one misstep on a basketball court, one giant leap for Yankeekind. We know how other stories played out, too. At the top of the page, beneath a 24-point headline, the lead story describes how Tampa Bay starter Dewon Brazelton took a no-hitter into the eighth inning against Florida but lost it on Mike Lowell’s two-out double. As with Felix Diaz, born just five weeks after Brazelton, it might have looked like big things lay ahead for the big righty. Alas, Brazelton — the third pick in the 2001 draft — would win five more games that season to finish at 6-8. He’d then go 1-10, with an 8.49 ERA, across his next two seasons before vanishing from The Show. Like Ken Harvey, he’d finish with the T-Bones. A lot had happened, and would happen, in the wake of a three-team deal. Re The Baseball Project. I’ve been aware of this diamond-centric supergroup for awhile, but somehow, the song “Box Scores” has eluded me — until now. It’s awesome. Wow. I was not aware of “Box Scores”. Thanks to both of you. Also, John, great work in providing more evidence that all roads to lead to New York. I dunno, man. According to MapQuest, there’s a dirt road near Deir ez-Zor, Syria, that dead-ends at the Euphrates.